1st Type in blue ink part dated OCT 6 -- on QV 1d (SG.31). 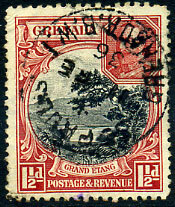 in the REVERSED position dated 1 SP 88 on QV 2½d (SG.32). 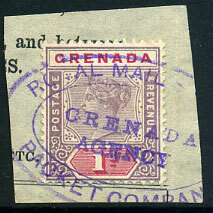 Grenada Parish "A" (St. John's) dated 26 AU 97 on St. Lucia QV 1d (SG.44). 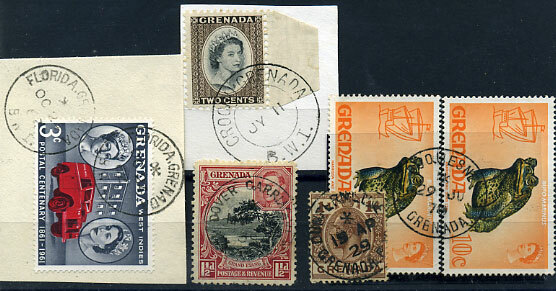 The special Windward island rate was introduced NO 1 1895 for mail between St. Vincent, Grenada and St. Lucia. 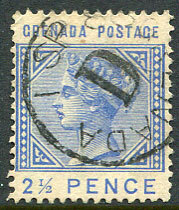 in blue dated 25 FE 92 on 2½d. on QV 8d (SG.47), horiz. crease. dated JA 13 14 on fine condition 1922 KGV 2/- Multiple Script wmk. 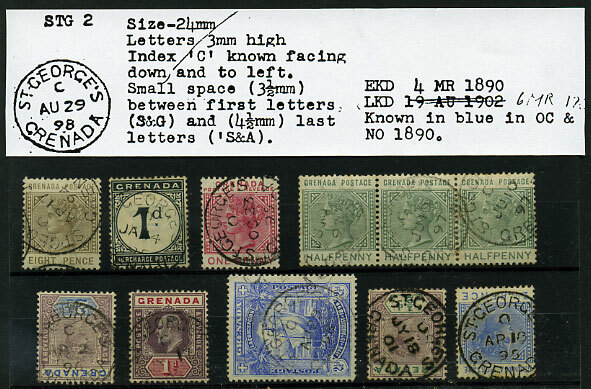 twelve stamps with fully dated "C" code on QV ½d, 1d values. 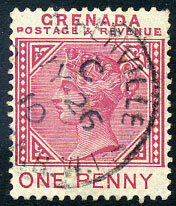 "C" code, eleven fully dated on QV 1d, 2½d values. 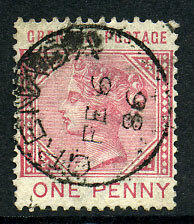 dated sideways down C/AP 17 94 on QV 8d (SG.35). 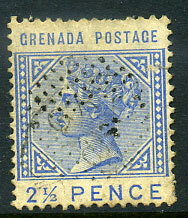 dated 13 AP 95 on vertical tete-beche strip of three QV 2½d (SG.32a, Cat.£60 for a pair). 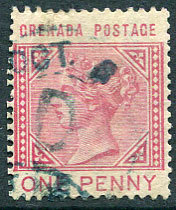 A/GRENADA/SP 07 84 on 1883 QV 1d carmine (SG.31). short-lived cds dated sideways up C/NO 19 85 on QV 2½d (SG.32). 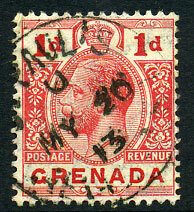 C/11 AU 22 on KGV 1d (SG.113). fullish indistinct on 1906 1d Badge (SG.78). */11 FE 36 on KGV 1½d (SG.137). 1st type dated APR 7 89 (for 1879?) 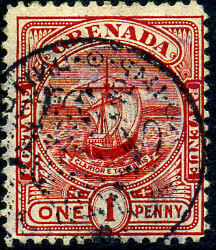 on 1878 QV 6d deep vermilion (SG.17, Cat.£38). (OF 1) 14 MY 08 on 2½d Badge (SG.80), rarely seen as an adhesive killer. 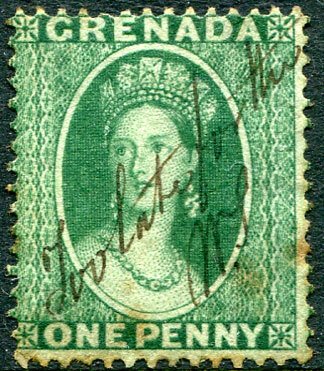 dated 3 NO 30 on piece with local circled "T." tax handstamp and Grenada 1d Postage Due alongside. 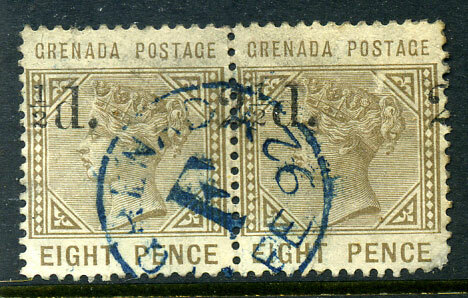 arrival dated 26 NO 96 on QV 2½d on 1d (SG.55a), toning. 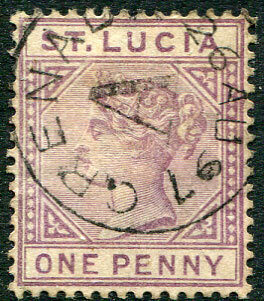 undated purple d/ring oval on QV 1d (SG.49) printed text piece. C/SP 27 00 on QV 2d mauve & brown (SG.50). C/NO 17 97 on QV 3d (SG.52). dated C/OC 6 09 on 6d Badge (SG.85). dated DEC 27 187(8?) on QV 6d deep vermilion small star sideways wmk (SG.17). dated s/ways down C/NO 13 30 on KGV 1d (SG.114). 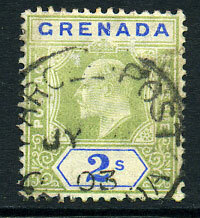 scarce "A" code dated SP 2 91 on QV 1d (SG.40), corner perf. fault. 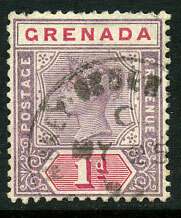 with light GRENADA cds on QV 2½d (SG.32), small closed tear top right. Error "½d. 2" for 2½d. on QV 8d (SG.47var), used horiz. pair dated blue ink 1- FE 92, small faults, possibly unique. previously unrecorded manuscript cancel with initials "WS" on 1875 QV 1d (SG.14), toned but unique. 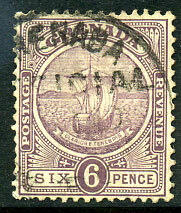 C/JY 26 10 on QV 1d (SG.40) showing short P in POSTAGE, rare re-introduction of QV 1d value during shortages KE7 adhesive. s/ways facing up C/MY 20 13 on KGV 1d (SG.91). dated -/JY -- 03 on colour washed KE7 2/- (SG.64). short-lived cds dated no/code FE 6 86 on QV 1d (SG.31). Recorded AP 2 85 (with C code until NO 15 85), thereafter no code until MR 1 86. 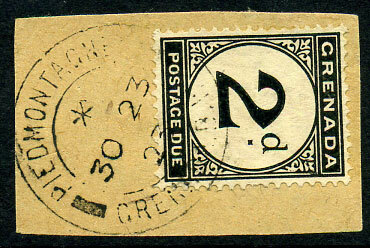 (C12) dated */30 23 23 on 2d Postage Due (SG.D13) piece. part strike dated C/7 DE 1(2?) on 6d Badge (SG.85), rarely seen as an adhesive killer. C/MY 25 9(9?) on QV 1d (SG.49). (STG 2, 24mm) scarce small 97 year slug examples dated C/SP 7 97 and C/SP 8 97, first with minor toning. 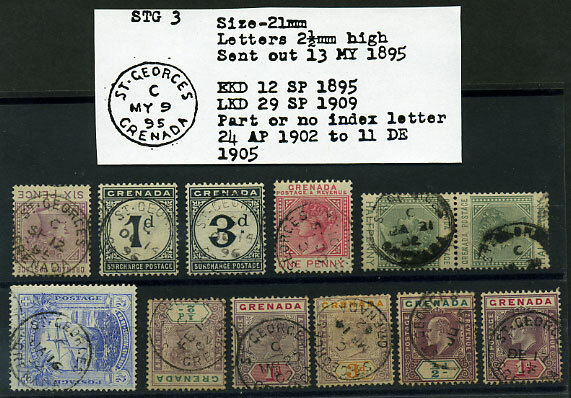 (STG 2): range on 9 different stamps. 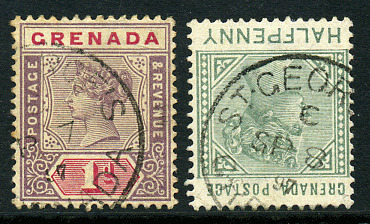 (STG 3): range on 11 different stamps incl. the ERD C/SP 12 95.
comprising: Fontenoy, Gouyave, Grand Anse, Grand-Roy, Grenville, Happy Hill, La Digue St. Andrews. (8 items). comprising: Crochu, Dover Carriacou, Dunfermline, Duquesne, Florida. (5 items). comprising: Belmont Carriacou, Belvidere, Birch Grove, Byelands, Calliste, Carriacou, Chantimelle, Concord, Corinth. (9 items).